The heat wave this past weekend here in LA made the idea of sitting in an air-conditioned movie theater more than usually appealing to me, so I ended up watching three thrillers. Thrillers are basically my favorite genre. I would sooner watch a mediocre thriller than sit through a critically acclaimed “feel good” movie like St. Vincent. That’s just the way I roll. The first one I saw was a French-Canadian film titled Tom at the Farm. It’s basically about a sado-masochistic relationship that often seems to be on the verge of becoming lethal. It’s OK. A big problem I had with this film is that I found the main character unsympathetic, since he seemed to like being bullied. I enjoyed Cop Car a lot more. It’s fun watching Kevin Bacon playing a thoroughly corrupt and cynical small-town sheriff. The director, Jon Watts, shows a real knack for building suspense. However, I found the up-in-the-air ending disappointing. I have to admit that I’m not big on up-in-the-air endings. A film, like a symphony, should have an ending that brings things to completion. 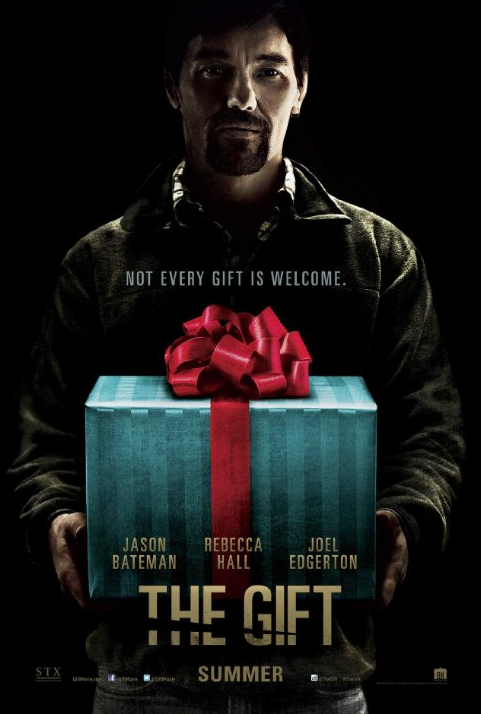 The best film I saw, though, was The Gift, written and directed by Joel Edgerton. It tells the story of a married couple, Simon (Jason Bateman) and Robyn (Rebecca Hall), who have just bought a house in the Hollywood Hills. While shopping one day, they bump into Gordon (Joel Edgerton), an old schoolmate of Simon’s. They have him over for dinner one day, and afterwards Gordon begins to drop by their house, leaving gifts and offering to help out with things. His behavior begins to seem intrusive and a bit unnerving. Robyn starts to suspect that Simon is not telling her the whole truth about his past relationship with Gordon. First-time director Edgerton does a good job of creating a sense of foreboding. The film benefits from strong performances, particularly from Hall, who does a good job of conveying Robyn’s conflicting emotions: she is simultaneously sympathetic towards Gordon and a bit creeped out by him. Although I mostly liked this film, I found the ending unsatisfying. We see Gordon gloating over a defeated Simon. Although Simon is truly a terrible person, Gordon’s own actions were sordid. He stalked Robyn and invaded her privacy; he basically used her to get even with Simon. I would have preferred an ending that did a better job of acknowledging the moral ambiguities of the situation. This entry was posted on August 20, 2015 at 8:11 am and is filed under Cinema. You can follow any responses to this entry through the RSS 2.0 feed. You can leave a response, or trackback from your own site.